. S. Loomis drew attention to certain similarities between the lance of the Grail castle and the spear that appears in the tale of the Irish hero Brian, from the Fate of the Children of Turenn. The three sons of Turenn were compelled by the god Lug to fetch for him the spear of King Pisear. When they reached his castle, Brian demanded the spear, at which Pisear attacked him. Brian killed the king and put his courtiers to flight. Then he and his brothers went to the room in which the spear was kept. They found it head down in a cauldron of boiling water, from which it was taken and delivered to Lug. This spear is one of the Four Treasures of the Tuatha Dé Danaan. ccording to Loomis, the spear that stands in the cauldron of hot water is identical with the Lúin of Celtchar, which (as described in one Middle Irish text) becomes hot and must be quenched in a cauldron of venom. In another Middle Irish text, there is a spear that becomes hot and needs to be quenched in a cauldron of blood. However, there is no evidence to support the identification of the Lúin with the spear of Lug, apart from the common association with a cauldron. One is a spear that bleeds into a cauldron and the other is a spear that becomes hot and can be cooled in a cauldron of liquid. eltic mythology is full of magic vessels. Another of the Four Treasures was the cauldron (coire) of the Dagda, which never ran dry and from which no one ever went away unsatisfied. If the Grail is descended from otherworld vessels of this kind — not from any one of them in particular but from the idea of them — then it too should be connected with regeneration and eternal life. There is already a hint that it is, when the banquet is served to Perceval and the Fisher King. The table on which the food is placed is made of ivory, resting on trestles of ebony, and we are specifically told that ebony last for ever, because it does not rot and cannot burn. There would be no point in this comment [by the poet Chrétien] unless it is meant to suggest that the scene in the castle has something to do with immortality, or 'lasting for ever'. t is possible that in his last opera Parsifal, Richard Wagner was reviving (consciously or unconsciously) a tradition that was older than the Grail romances in which he had found some of his raw material. The complementary relics of the Grail and the Spear as they appear in the opera are not only linked but drawn towards each other. It might even be said that these strange hallows in some way direct the action of the opera: at one point, Wagner's protagonist Parsifal says that he heard the Grail call out to him, asking the hero to save it from hands stained with sin. It is only when Parsifal holds the Spear in his hand that he knows that it belongs with the Grail, that he has a mission, and that his mission is to reunite the two of them. 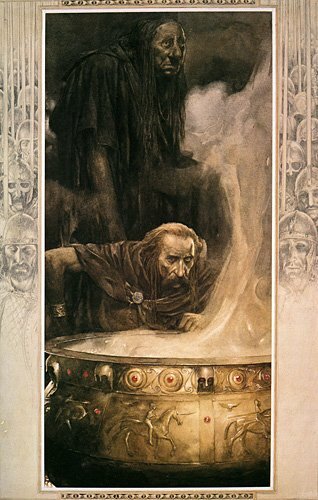 agner's Grail is not a cauldron and neither were the Grails of the romances: in some cases a cup, in Wolfram a stone, and in other texts not clearly defined but a vessel larger than a cup. It is striking that Wagner's Spear starts to bleed only when it is in the presence of the Grail; in the last lines of the opera, the hero describes the yearning of the Spear for the blood that flows in the Grail. Here there is a reference to the interpretation of these objects as Christian relics: the blood that flows from the Spear into the Grail is the divine blood. For Wagner this was the essence of free-willed suffering, which in some mystical way he saw as the only hope for a regeneration of mankind.